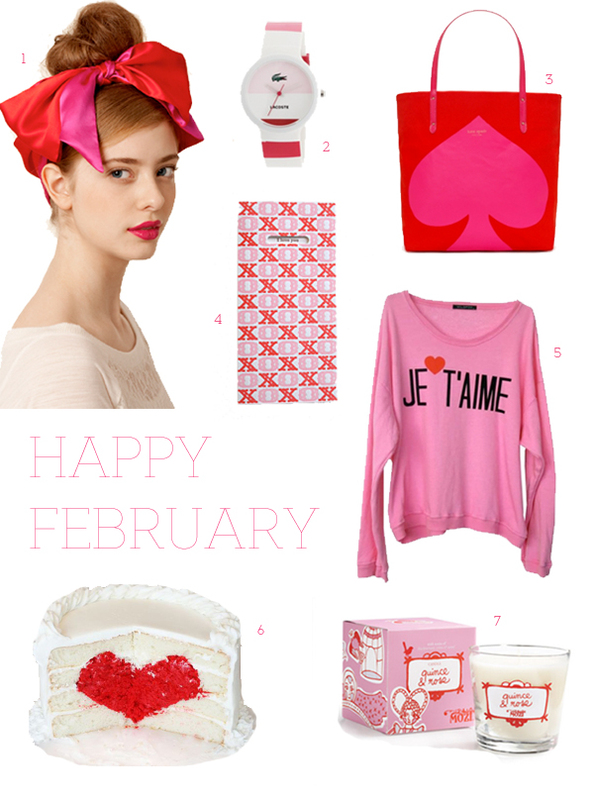 Wishing you a Happy February with colors of red and pink. What do you think about Punxsutawney Phil, will he see his shadow tomorrow? Has anyone been to the actual ceremony in Pennsylvania, I think it would be a riot. Read about it here. What a cute cake idea! I'm fascinated by the heart cake. I'm definitely going to look up the tutorial. I love that cake!! Great collection. this post is so fab - it makes me want to sit down and make tons of homemade valentines! happy february! love the sweatshirt and the watch...feeling so February now! ah! what a gorgeous roundup! so inspiring and now i'm really looking forward to vday! I want that je t'aime sweater that is just so cute! I can't get enough of that giant satin bow! I just heard that the groundhog didn't see his shadow. Hurray for an early spring! Happy February to you! I love that Valentine's Day isn't just about couples. It's about spreading love and cheer to everyone special in your life. And how adorable is that heart cake! P.S. Punxsutawney Phil says we'll have an early spring this year. Woot! What a great compilation! That heart cake is awesome!! I love the sweatshirt too. that cake makes me HAPPPPPPPPY! love it!!! everything is SO cute. and that cake? how the HECK do you make that?! that's insane. love all of this stuff for v-day! xo. i must try that cake idea - love it! WOW! The cake is boggling my mind...I'm definitely going to challenge myself with this one! I think I love Valentine's Day so much because I love the colors! love the sweatshirt! I just blogged about this cake too! Amazing. such a cute valentine's day cake! I love the idea of a quince-and-rose scent! Great post! I am in love with that cake - I have to make it ! We have so many of the same obsessions in this post! 1. ban.do 2. that cake 3. ALL that is left! Ooh la la...such sweet and romantic finds. I just thought i'd share the link of another shop with a valentine's theme that you might like.